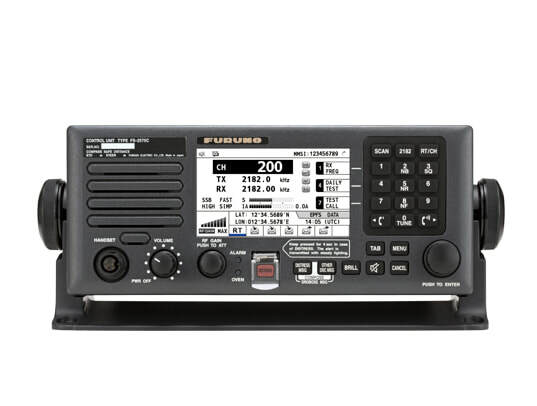 Reliable MF/HF Radiotelephone for general and distress communications with integrated DSC/DSC Watch ReceiverMeets the new ITU recommendation on digital selective calling system for use in the Maritime Mobile Service, ITU-R M.493-14. Fully meets GMDSS carriage requirements for SOLAS ships. Meets the new ITU recommendation on digital selective calling system for use in the Maritime Mobile Service, ITU-R M.493-14. High-contrast 4.3" bright color LCD (480x272 pixels). Capable of distress, safety and routine communication. Instant selection of 256 user-specifed channels with a rotary knob or direct keypad input. Quick access to DSC message composition by dedicated keys on the control unit. Quick access to dedicated functions in the menu operation using numeric keypad.